Eddie likes green and trains - steam engines, to be exact! In the background you can see the real deal, but it was not as delicious. For Devon's first birthday, a cake with sea life and tiny cookie surfboards. Inside was rich chocolate cake and berry buttercream filling with fresh berries. Mahalo! To counteract the march of time, this birthday girl needed a shot of nostalgia for her college alma mater. So what better than Joe the Bruin sporting a party hat, surrounded by UCLA-themed lettering and cupcakes? 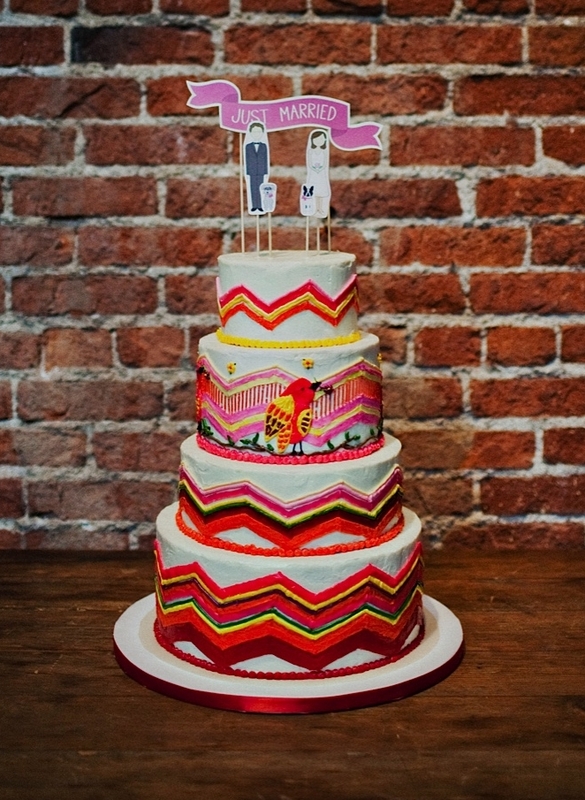 A cake with varied design for sophisticated couple with eclectic tastes. Inside was almond-vanilla flavored white butter cake, with my favorite dreamy buttercream frosting. Leila was into "yellow" and "circles". This cake brought those two things together with whimsical color. At three, Ben is a kid who knows what he likes: not Batman - too obvious. He prefers Robin. So who better to drop in on his birthday? 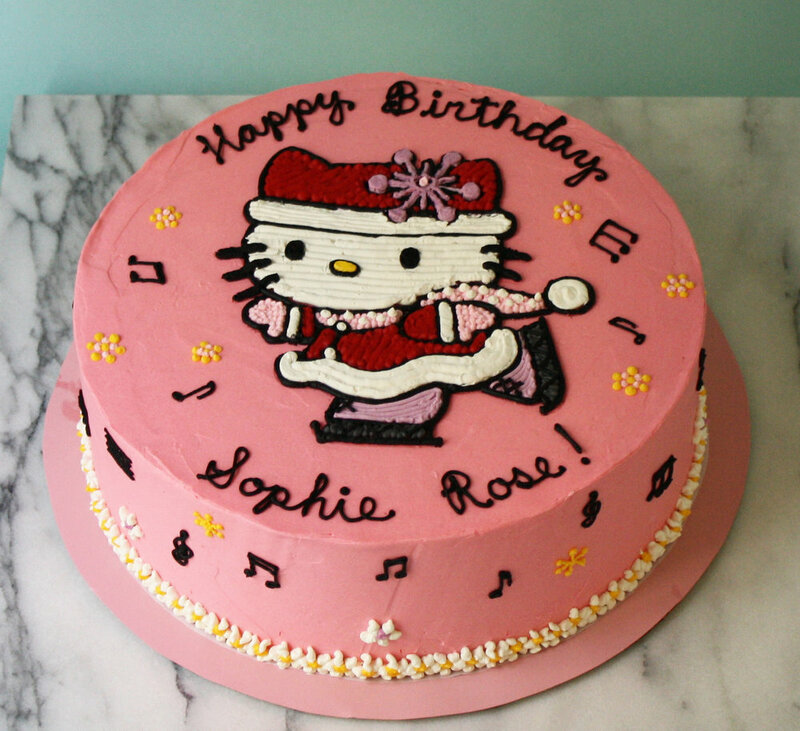 For Sophie Rose's very special 6th birthday party, she wanted a special cake featuring Hello Kitty figure skating, surrounded by musical notes... you can practically hear the Skater's Waltz! Wedding cake for MJ and Beth. The Baltic crosses and inscription were designed to match their rings. Amanda loves white butter cake and vanilla buttercream frosting, but I designed the outside to match the color and theme of her beautiful invitations and favors. A rich dark chocolate cake with simple graphic design and refined lettering. A buttery lemon cake with lemon curd filling and buttercream. The design was inspired by the wallpaper in my pediatrician's office... that may not sound like a happy memory, but I always got a lollipop when I left, so it was all good to me. For his circus-themed party, Arlo was celebrated by a parade of animals carrying balloons in his honor. 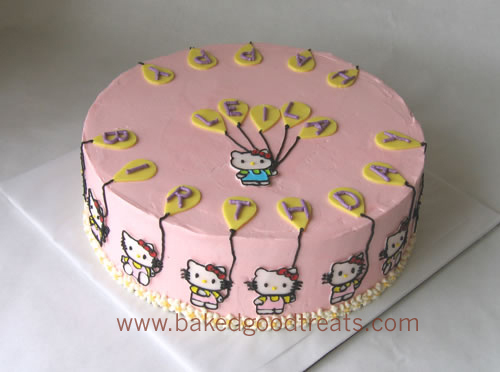 Leila turned three with a great deal of fanfare from her Hello Kitty friends. A unique cake for a unique couple, Kirby and David. The cake design picked up elements from their daughter Zuzu's lovely dress. The cake itself was butter cake with pomegranate buttercream filling and honey-mascarpone buttercream frosting. Monkeys for Padraigh's first birthday. Double-decker birthday cake in handsome stripes. Inside was devil's food cake with Nutella buttercream filling, with vanilla buttercream on the outside. For her beach-themed birthday party, Zoe had dolphins and sweet pink seashells.